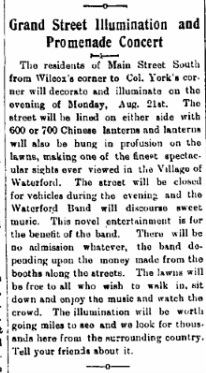 In 1905, Waterford conducted a very successful experiment with decorative street illumination for the benefit of the Waterford Band. 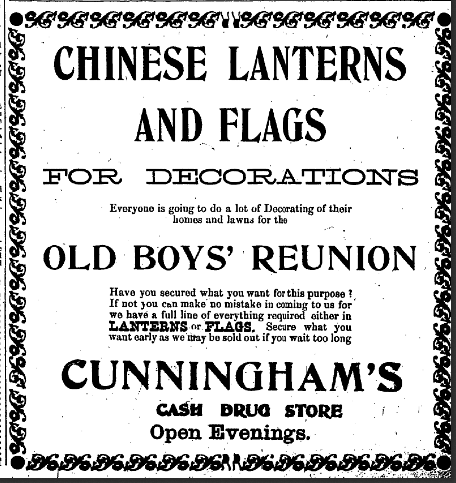 The residents of Main Street were called upon to display hundreds of paper "Chinese Lanterns" on an evening in August. The illumination was strongly supported by the P.G. Pearce, editor of the Waterford Star. His house and family are seen above with their lanterns, flags and bunting (and the full picture is further down this page). The residents of Main Street South from Wilcox's corner to Col. York's corner [this is the building with the turret at the corner of Green and Main] will decorate and illuminate on the evening of Monday, Aug. 21st. The street will be lined on either side with 600 or 700 Chinese lanterns and lanterns will also be hung in profusion on the lawns, making one of the finest spectacular sights ever viewed in the Village of Waterford. The street will be closed for vehicles during the evening and the Waterford Band will discourse sweet music. This novel entertainment is for the benefit of the band. There will be no admission whatever, the band depending on the money made from the booths along the streets. The lawns will be free to all who wish to walk in, sit down and enjoy the music and watch the crowd. The illumination will be worth going miles to see and we look for thousands here from the surrounding country. "The street was a bower of beauty and a perfect fairyland." Last week the Star told its readers that the Street Illumination and Promenade Concert would be worth going miles to see and the people by hundreds came for miles on Monday night to see one of the grandest street decorations and illuminations ever witnessed in this section. The street was a bower of beauty and a perfect fairyland. 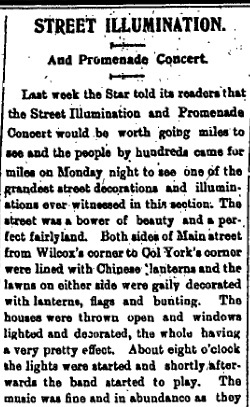 Both sides of Main street from Wilcox's corner to Col. York's corner were lined with Chinese lanterns and the lawns on either side were gaily decorated with lanterns, flags and bunting. The houses were thrown open and windows lighted and decorated, the whole having a very pretty effect. About eight o'clock the lights were started and shortly afterwards the band started to play. The music was fine and in abundance as they played almost continually. Several gramophones and pianos along the street added to the pleasure of the evening's entertainment, while the lawns were supplied with seating accommodations for those who wished to rest and watch the throngs go by. The booths in aid of the band were not what they should have been and in fact there was only one running. No doubt when the entertainment is repeated at some future date this part of the entertainment will be properly looked after. At 9.45 it started to thunder and lightening and soon the rain was pouring down. The crowd dispersed very rapidly and the entertainment was brought to a sudden close. Most of the lanterns were saved. After the rain stopped the band went on playing until about 10.30. Many seem to favor repeating the illumination next month and if such is decided we will give due notice through the columns of the STAR. It is estimated that from 1500 to 2000 people were present and this number would no doubt be doubled should the entertainment be repeated. Source souvenir booklet can also be seen at Waterford Heritage and Agricultural Museum. 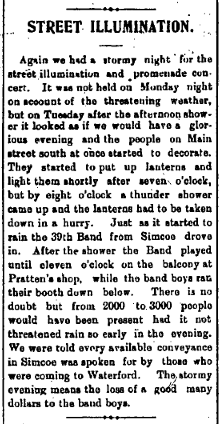 "the band will discourse sweet music"
The Band boys are anxious to have another street illumination and promenade concert as they realize considerable money can be made from booths and are preparing to go in for it extensively. 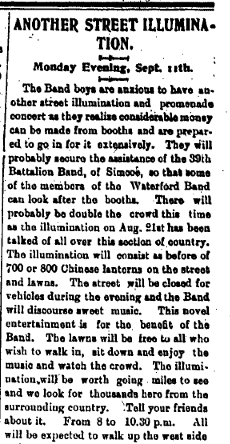 They will probably secure the assistance of the 39th Battalion Band, of Simcoe, so that some of the members of the Waterford Band can look after the booths. There will probably be double the crowd this time as the illumination on Aug. 21st has been talked of all over this section of country. The illumination will consist as before of 700 or 800 Chinese lanterns on the street and lawns. The street will be closed for vehicles during the evening and the Band will discourse sweet music. This novel entertainment is for the benefit of the Band. The lawns will be free to all who wish to walk in, sit down and enjoy the music and watch the crowd. The illumination will be worth going miles to see and we look for thousands here from the surrounding country. Tell your friends about it. From 8 to 10.30 p.m. All will be expected to walk up the west side of Main street and down the east side. Two policemen will be on duty to see that order is observed and that none of the decorations or lanterns are destroyed. Remember the date - Monday, Sept. 11th. If the night should be stormy the illumination will take place the next night, Sept. 12th. Again we had a stormy night for the street illumination and promenade concert. It was not held on Monday night on accout of the threatening weather, but on the Tuesday after the afternoon shower it looked as if we would have a glorious evening and the people on Main street south at once started to decorate. They started to put up lanterns and light them shortly after seven o'clock, but by eight o'clock a thunder shower came up and the lanterns had to be taken down in a hurry. Just as it started to rain the 39th Band from Simcoe drove in. After the shower the Band played until eleven o'clock on the balcony at Pratten's shop while the band boys ran their booth down below. There is no doubt but from 2000 to 3000 people would have been present had it not threatened rain so early in the evening. 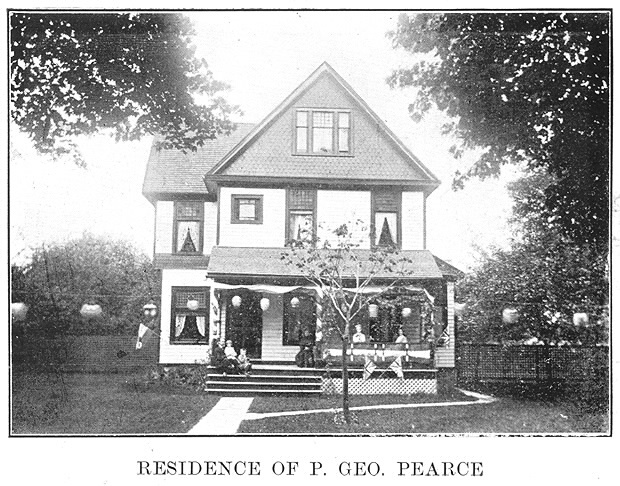 We were told every available conveyance in Simcoe was spoken for by those who were coming to Waterford. The stormy evening means the loss of a good many dollars to the band boys. 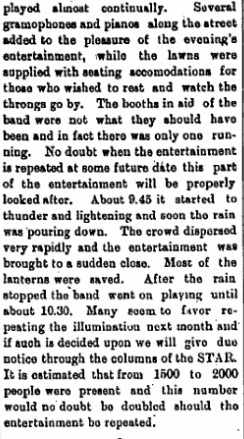 Here is an actual 1912 recording of Norfolk's 39th Rifles, who helped out at the IIlumination. Just press the Play button on the left. Norfolk's 39th are playing the first tune. Mountain Rose, along with the 13th Royal Regiment. The lantern seed had been planted. 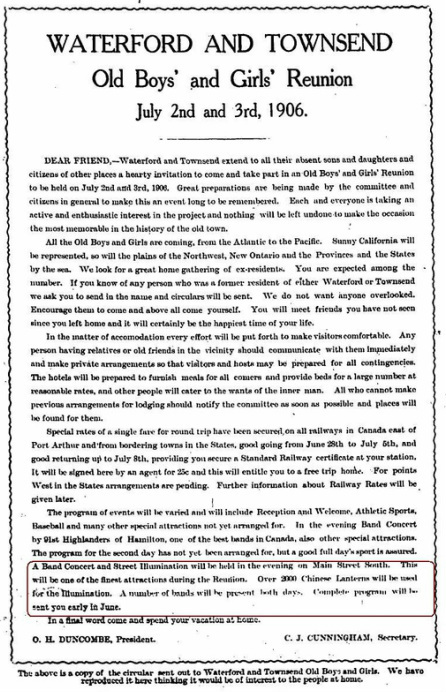 In 1906, the town was planning for the great Old Boys' Reunion, intended to gather previous residents from far and wide for a reunion in July 1906. In April, many committees were struck, including an Illumination Committee with our friend Mr. Pearce - as well as O. McMichael, James Beemer, A.E. McMichael, A.M. LIttle, Henry Serles, Charles Erwin, John McCool, F. Bauslaugh, and Peter Stafford. ... A Band Concert and Street Illumination will be held in the evening on Main Street South. This will be one of the finest attractions during the Reunion. 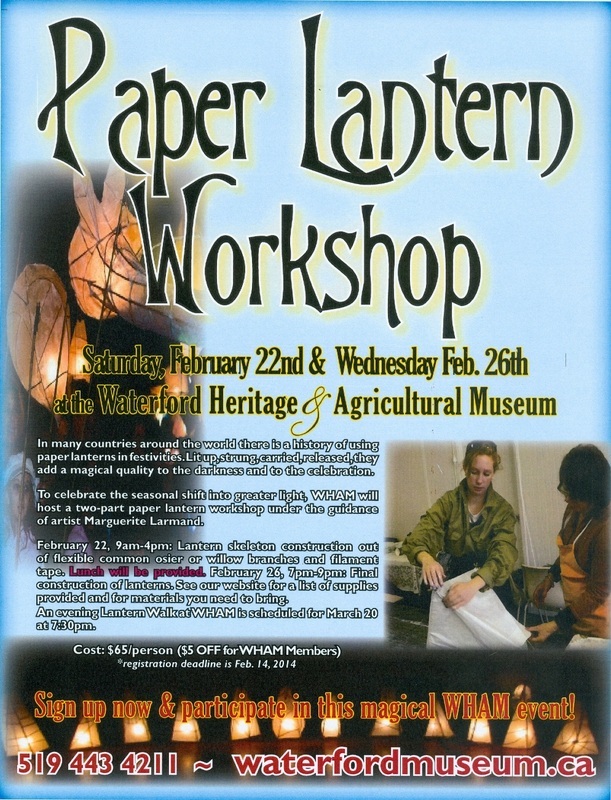 Over 3000 Chinese Lanterns will be used for the Illumination. A number of bands will be present both days. But, sadly, while the reunion enjoyed terrific weather and was extremely well attended ... the Illumination was again rained out. the citizens of Main Street south had prepared for a magnificent illumination. The bands got under shelter and played for about an hour.